A huge portion of the challenge in building a self-driving car is environment perception. Autonomous vehicles may use many different types of inputs to help them perceive their environment and make decisions about how to navigate. The field of computer vision includes techniques to allow a self-driving car to perceive its environment simply by looking at inputs from cameras. Cameras have a much higher spatial resolution than radar and lidar, and while raw camera images themselves are two-dimensional, their higher resolution often allows for inference of the depth of objects in a scene. Plus, cameras are much less expensive than radar and lidar sensors, giving them a huge advantage in current self-driving car perception systems. In the future, it is even possible that self-driving cars will be outfitted simply with a suite of cameras and intelligent software to interpret the images, much like a human does with its two eyes and a brain. When operating on roadways, autonomous vehicles need to be able to identify traffic signs in order to determine what actions, if any, the vehicle must take. For example, a yield sign warns drivers that other vehicle traffic will soon enter the vehicle’s path, and that those other vehicles should be given the right of way. Without a robust mechanism to quickly and correctly identify the meaning of traffic signs, autonomous vehicles would get into trouble with hazardous road conditions and with other vehicles. I created a software pipeline containing a convolutional neural networks to classify traffic signs. The pipeline trains and validates a neural network model so it can classify traffic sign images using the German Traffic Sign Dataset. Additionally, a study of model performance on images of unseen German traffic signs from the internet is included. The following charts show the distribution of the instance classes in the training, validation, and test datasets. 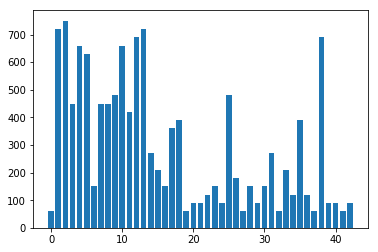 Note how in all of the datasets, some of the classes (1-5,7-10,12-13,38) have a much higher representation in each dataset than others. This may cause bias in the predictions generated by the classifier itself; additional classification robustness could be added by adding extra instances of the classes which are under-represented. As a first step, all images are converted to grayscale to reduce the dimensionality of the problem that the classifier needs to learn. Given the small number of training examples (< 100k), the extra dimensionality in representing colors might overwhelm the optimizer and it would not fit a robust model. Grayscale was also used in my previous lane finding project, and given the success of finding detail in a low-resolution grayscale image similar success here is expected. Here is an example of a traffic sign image before and after grayscaling. As a last step, image data is normalized to have mean zero and low standard deviation for each pixel value, to allow the learning optimizer to have an easier time converging on a lower overall classification loss. Even though a class imbalance exists in the training data set, the training set is not augmented with more data to study the bias of the final classifier (which would be revealed during the validation step). Mini-batching of 128 training instances looped with a maximum of 200 epochs of training and weight optimization until the accuracy is above 93.5%. 93.7% is hit after 16 epochs, at which point the training loop completes. The neural network began with the classic LeNet-5 image classification architecture, being a canonical and well-understood image classification neural net architecture for grayscale image classification. This seemed like an obvious starting point to classify small (32×32 pixel) grayscale images with a limited set of output classes (43). Modifications are added based on the Alexnet image processing architecture, as it is also well-understood and makes significant performance improvements on LeNet. Further modifications include using 50% dropout layers after every fully connected layer to prevent overfitting on training data, making the fully connected layers not reduce dimensionality (input and output dimensions are the same until the final output layer), and starting with initial positive values for layer bias terms rather than zero (since ReLU is used as an activation function, it is desired to prevent more connections to drop out than absolutely necessary). Training set accuracy shows that the model is fitting to the training data well; perhaps too well, as a 97% accuracy is quite high. Luckily, the difference in performance between the validation and training sets (delta of 3.3%) shows that the model is not overfitting too greatly. Test set accuracy of 90.5% indicates that on completely unseen data in the real world, this classifier would classify slightly better than nine of out ten traffic signs correctly, which is interesting academically but surely would be a problem for a true self-driving car (as even one incorrectly classified traffic sign could prove disasterous). This image may be harder to classify, as it has a changing background image due to the horizon. This is likely to be a simple image to classify; it is clear with an empty background. This image has a solid, though black, background which is likely to be easy to classify (even with a small fleck of black in the right side of the triangle). This image is likely to be difficult to classify, being captured at a non-perpendicular angle, as well as having a complicated background involving the ground, sky, and clouds of different colors and shapes. This image should be relatively easy to classify; it has some background noise but the image itself is clear except for some clipping at the bottom of the circle. The model is able to correctly guess 4 of the 5 traffic signs, which gives an accuracy of 80%. Due to the limited number of test examples in my set of 5, the accuracy of 80% is lower than the original test set accuracy of 90.5%. 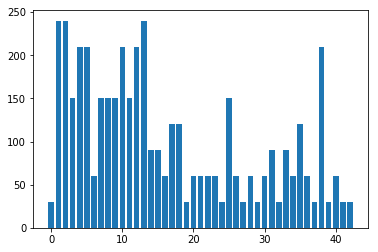 The code for making predictions on the final model is located in one of the last cells of the Ipython notebook.